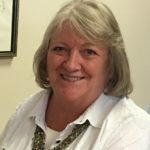 Associate Donna Schwarz dates her introduction to the Viatorians back to 1995, when she began working with the Office of Viatorian Missions, as an administrative assistant. A little more than five years later she would be promoted to work as administrative assistant to the provincial, and she hasn’t looked back. Over the years, Donna has worked closely with Fr. Mick Egan, CSV, Fr. Charles Bolser, CSV and Fr. Thomas von Behren, CSV. Through working with Viatorians, Donna and her husband, Tim, discerned a calling to join the community as lay associates. In fact, the were among the second group to become Viatorian associates. They made their first commitment in 2000 and ultimately made their definitive commitments in 2010. Both were acknowledged at the Provincial assembly in 2015, for reaching the 15th anniversary of their commitments. Over her more than 20 years of partnering with Viatorians, Donna has played a lead role in animating the spiritual and social life of the community. She has served on both the regional committee and Viatorian Community Council, that plan and carry out important spiritual dates within the community, as well as the Provincial assembly. 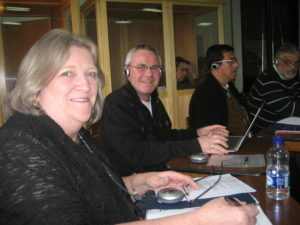 In 2011, she was elected to serve as part of the U.S. delegation to the Viatorians’ General Assembly in Bogotá, Colombia. 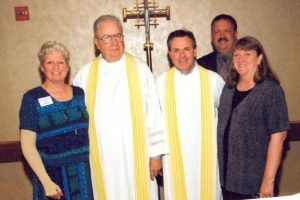 Donna and her husband are active members of St. James Church in Arlington Heights, but they draw rich, spiritual renewal from their longtime membership in a small faith group made up of Viatorian associates, brothers and priests. All of these opportunities to deepen her faith came to mind, when Donna and her husband attended a day of reflection. They and other Viatorian associates gathered with lay members of other religious communities to consider the impact of being an associate — and of their impact on their respective communities.